The Secrets To Transforming An Average Chord Progression Into Amazing, Unique, And Incredible Sounding Music! Today, in the final part to our series on creativity with chords on guitar, we are going to take the strategies and methods learned so far in these lessons and apply them to two common chord progressions I’m sure you have played many times on your guitar before. However with the way I have been getting you to play chords on your guitar throughout this series, these chord progressions will sound anything but common. If you are yet to check out this lesson series on creating amazing music using chords on guitar then I highly recommend you do so. What I will be covering in today’s lesson will be understood on a much deeper level by doing so. 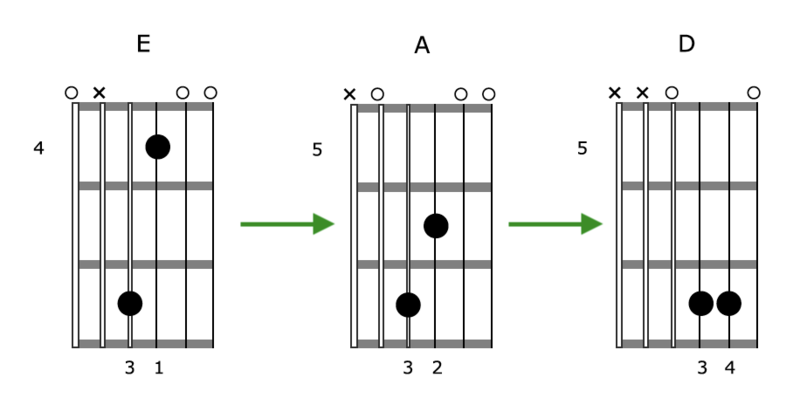 With that said, we are now going to introduce a third chord to go with the first two guitar chords from parts 1 and 2 of this lesson series. Which chord I hear you ask? Together with all 3 chords, you will now have the scope with which to create amazing, unique, and incredible sounding chord progressions on your guitar. In this lesson I am going to get you doing exactly this with two of the most common chord progressions you’ll ever come across. Don’t mistake common as boring though. These progressions will sound anything but boring! Once again I will run you through the steps we did with the A and E chords in the first two lessons of this series with the D chord. I am going to be very brief here as you should be getting the idea of the method we have been using by now. Of course be sure to watch the video that accompanies this lesson for detailed explanations and demonstrations. Notice these shapes are on the top 3 strings of your guitar. The A and E shapes were on strings 2, 3, and 4. There is a very good reason for this I will reveal shortly. The open 4th string is a D note, the root note of our chord. 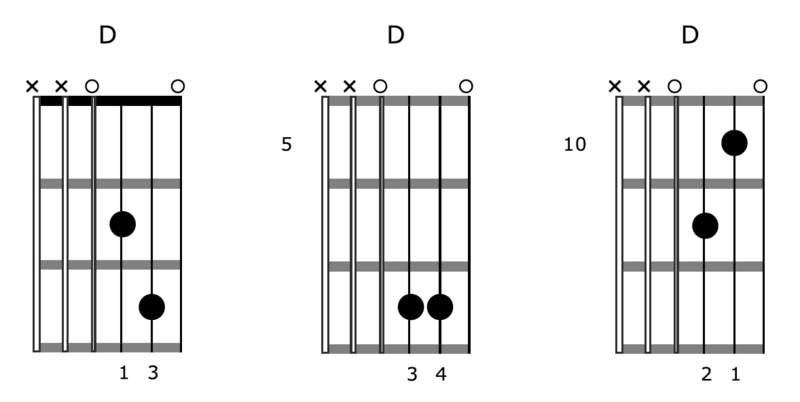 As was the case with our first two chords, D works out great in that we can access the root of the chord on one of the lower three open strings of the guitar. This is why I placed the D chord shapes on the top three strings, giving you access to this open 4th/D string. As we did with both the A and E chords previously, the magic really starts to happen when adding notes to each of the D chord shapes. Remember all notes can work, in and out of key. It’s a matter of working with each sound and getting it in your ear that will determine how well you can get it to work within the context of the chord. Watch the video to hear demonstrations of this. 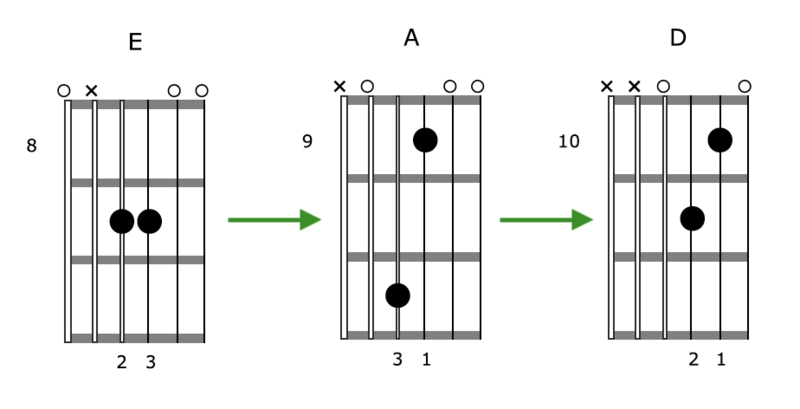 In order to create and apply with each of our A, E, and D chords covered in this lesson series, we need to organise each of them by position on the fretboard. Learn the groupings of the chords above well. 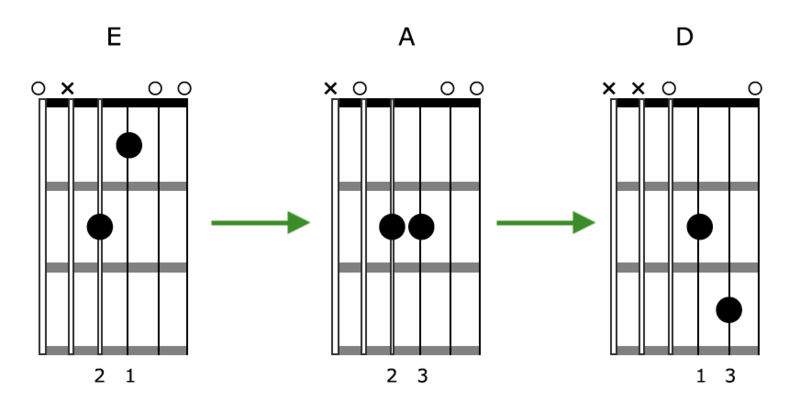 Visualising how things relate to each other on the fretboard, such as the chords covered in this lesson series, is essential in having them under your fingers and ready to go in the actual act of playing guitar, where you have zero time to think. 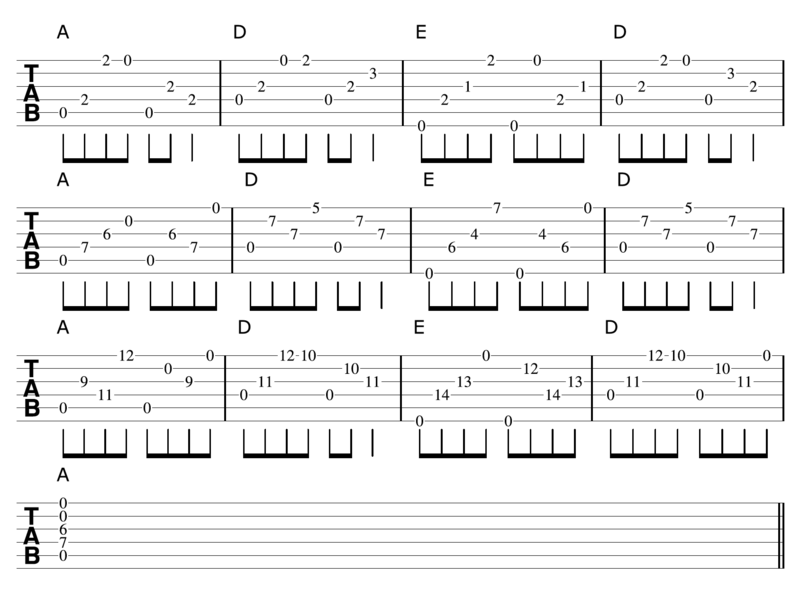 The following are two of the most common chord progressions you will play on your guitar. However, using our creative chord strategies learned throughout this lesson series you will hear they have been totally transformed from how you would normally hear them. Now you have three chords under your fingers with this method, these are the kinds of things you can do. 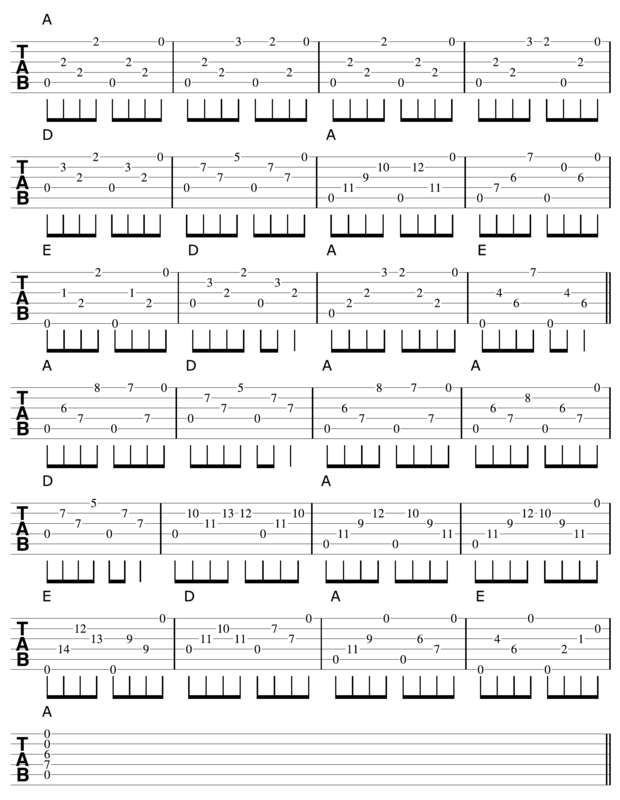 Each time I play through the progression above, I am moving up the fretboard to the next position to play each of these chords. Be sure to listen to the example above and watch the video to hear it played. The progression above is made up of two chorus’ of a 12 bar blues in A. Throughout, a variety of the chord shapes you have learned in this lesson series are used for the A, D, and E chords. Now you have the A, E, and D chords under your fingers using the method I have shown you throughout our chord creativity lesson series, there are many progressions and songs you can apply them to. Each song above is either entirely made up of A, D, and E chords, or features them very heavily. Use these songs and progressions to create all kinds of cool versions with the method taught throughout this guitar chord creativity lesson series.